I meant to get this recipe posted before Thanksgiving, but that clearly didn't happen. Oh well, if you still have leftovers in your fridge, give this a try. If you ate them all already, give this a try anyway! It's inspired by a salad I had from Trader Joe's. Their version left a little something to be desired though, so I made my own. I'm a fan of hearty salads - if I'm going to eat a salad, it needs to be filled with all the things... protein, something sweet, something tart, and something crunchy. 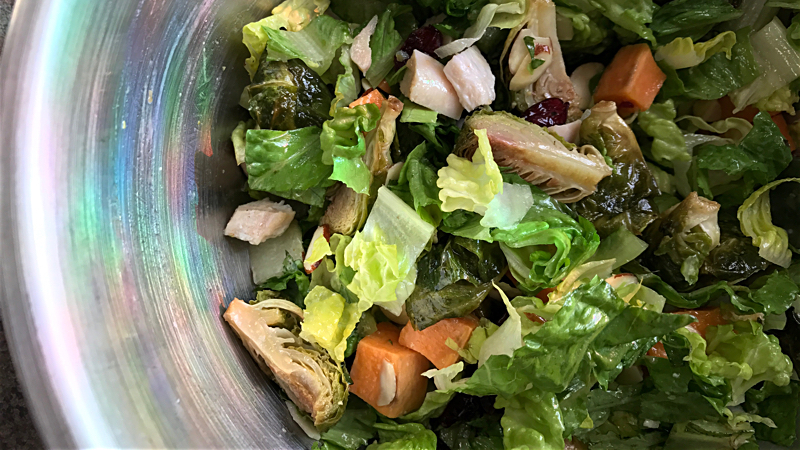 This salad has all of those things, and it's perfect for this time of year! Preheat the oven to 375°F. Lay chicken/turkey breast on a sheet pan- salt and pepper both sides and drizzle with a little bit of olive oil. Do the same thing with the brussels sprouts and sweet potatoes on a different sheet pan. Bake until chicken/turkey reaches an internal temperature of 165°F and until the veggies start to brown and soften, approximately 30 minutes. Chop the romaine and baby spinach into bite size pieces and toss into a large mixing bowl. 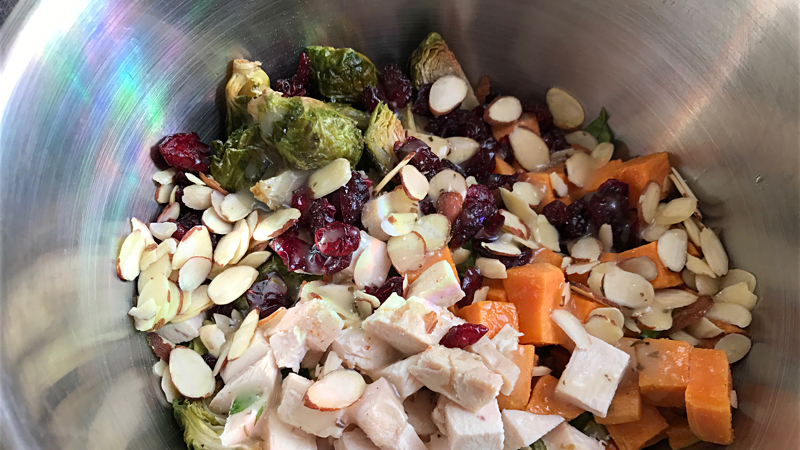 Top with chopped chicken/turkey, roasted brussels sprouts and sweet potatoes, almonds, and dried cranberries. Drizzle with desired amount of lemon vinaigrette. Toss the salad until coated, and enjoy! * If you're like me and just want to have salad ingredients on hand for yourself for the week... I prep the chicken and veggies ahead of time, and store them all in separate containers. Then I can assemble a salad for lunch as needed. I got 4 lunches out of these ingredients, hence the 4 salad yield. ** You can use any salad greens you like - I usually go for arugula or spring mix, but organic romaine was on super sale the week I made this, so that's what I bought! *** I usually make my own salad dressing, but I was lazy this time around. Besides, why mess with a good thing?